Tomorrowland is the “futuristic” land of the Magic Kingdom. Space Mountain, Tomorrowland Transit Authority, the Astro Orbitor, all sorts of attractions exist in Tomorrowland that point towards the future of mankind. The main attraction of Tomorrowland is Space Mountain. This indoor roller coaster is a futuristic ride as you launch into space from the launching pad at the beginning. As a roller coaster, it isn’t bad, but it is in the dark, and the first time I rode it, I was trying to figure out which way the car was going to turn, but I kept guessing wrong, so by the end of the ride I had a splitting headache! The really neat thing about Tomorrowland is that there is so much variety. Astro Orbiter is a fun kids ride — to get up there you have to take the elevator to the roof to load into your space vehicle! I don’t ride this very often, but Sophie loves it! Buzz Lightyear’s Space Ranger Spin is a classic shooting game. Just like the movie, you are tasked with defeating Emperor Zurg, and you control your vehicle and shoot the aliens to gain points. The more points you gain, the better you rank! I like that ride, it is one that I’m actually not that bad at! “Why did the chicken cross the road? To get away from KFC!” When the monster told the joke, he said afterwards, we don’t get it either! But everyone laughed! Stitch’s Great Escape is NOT my favorite ride. It is a dark ride, where you sit in and try to catch Stitch as he wanders throughout the chamber that you are in. Stitch is full of mischief, and you encounter several things that let you know that he has been by! The Tomorrowland Speedway is a simple racetrack where you can drive your race car around in a road course. Unfortunately, the Speedway isn’t the fastest, of course, but even worse is that your car has a rail, so if you encounter someone slower, you can’t go around. But it does have to be tailored towards kids of all ages — it isn’t a go-cart track, after all. The TTA is one of my favorite rides. It can be so relaxing, especially near dusk, to hop on the TTA and just take a ride around Tomorrowland. You’ll see parts of Space Mountain, you’ll ride above the walkways below — it reminds me of the Skyway that used to grace the Magic Kingdom and other Disney parks. One other thing you will see if you look closely is the original prototype model that was made to represent EPCOT. This brings me to my favorite attraction of Tomorrowland — Walt Disney’s Carousel of Progress. Did you know that the Carousel of Progress was originally designed and constructed for the 1964 World’s Fair? I absolutely love the Carousel of Progress. This theatrical show takes place in a revolving theater! Your trip takes you to the turn of the century to meet an American family and follow it’s progression throughout the years. Each change in scenery your theater revolves around to the next scene. It is a marvel of technology that dates back to 1964, and is still operational today. If you’ve never seen the Carousel of Progress, you are missing out — check it out the next time you are at the Magic Kingdom! In addition to the attractions, though, are some good places to eat, although we seem to frequent just one: Cosmic Ray’s Starlight Cafe! What makes Cosmic Ray’s special is that you can get sandwiches, or chicken, or burgers all from the same restaurant. Just pick your specialty and go for it. In addition to the plentiful seating, there is also the music! Take some time and listen to Sonny Eclipse! 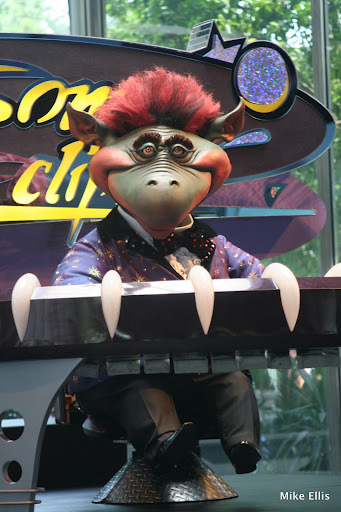 However, one thing that we have never tried that I have just heard about is the Tomorrowland Terrace Cafe. It seems that they have a desert party that you can do, followed up with a choice seat to see the Wishes Fireworks Spectacular. This might be something to try out next year! I hope that this trip to Tomorrowland has given you some insight into the things you can do, and to hopefully get you excited to take a trip to the Magic Kingdom and the other Walt Disney World theme parks! Talk to you later! Big Thunder Mountain Railroad — A Trip to the Old West! Magical Blogorail: Tackling Tomorrowland at Night! Disney in Pictures — Disney Coasters! 9 Days til Disneyland – Splash Mountain!